Technology Today asks Chris Ogilvie-Taylor, the CEO of edutech provider Marsden Grant International, about working in the educational supplies sector. Technology Today (TT) asks Chris Ogilvie-Taylor (COT), the CEO of edutech provider Marsden Grant International, about the frustrations, the highs and the lows of operating in the educational supplies sector. TT: Good day so far? TT: That’s really great but then they won’t want to upgrade to the latest CleverBoard model? COT: Well that’s true but as an exemplar of the longevity and classroom suitability of our products, it’s a brilliant testimonial. TT: So all is good? COT: Not quite! An international school that had been deliberating over buying our CleverTouch IFPD (Interactive Flat Panel Display) for the past five months has now finally ordered but realises that the school is about to return for the new term and our standard delivery by sea from our UK factory will mean that the equipment will arrive after the school starts so they have instructed us to send the equipment by air freight. TT: So what’s the problem? COT: Air freight is hugely expensive so all the savings they’ve made by removing features from our product to get the price down, they are just handing back to the air cargo company. Honestly, it’s pretty ridiculous. TT: Do the school’s academics know what’s going on? COT: I doubt it. The procurement department will probably blame the delay, caused by their procrastination, on us! TT: So it’s not all milk and honey in edutech? COT. Far from it! Producing fit-for-purpose professional quality classroom technology at a price that is competitive with the cut-price bucket-shop operators is a continual challenge. TT: So price dominates in schools’ buying decisions? COT: For some, not all. There are buyers in schools who realise the true value of our products and wouldn’t give house room to the substandard inadequate tech from some resellers. But we have to keep reminding schools how they think some screens and software can be offered cheaper, the answer to which is that the producers cut every corner they can in both hardware and software so the school is buying a very inferior replica of our product. And then the problems begin post-purchase. TT: But even with all the junky stuff around, you’re still market leader with CleverTouch? COT: Yes and that shows just how many buyers have the sense not to buy on price alone since we’re not the cheapest IFPD and don’t promote ourselves as such. TT: Where is CleverTouch priced on a scale of 1 – 10, with 1 being cheapest? COT: 3/4. We aren’t and can’t be the cheapest with the quality software and features-full hardware that we provide but equally we aren’t anywhere close to being the most costly. TT: Where are your markets? COT: We work right around the world from Australia to Zimbabwe! TT: You sell the IFPD CleverTouch in Africa? COT: Not CleverTouch but CleverBoard (IWB), yes. It’s the most fantastic and satisfying experience to see teachers using our instructional technology in the remotest and poorest schools. I have enormous admiration for the Principals who have very little money to spend but are adamant that what little financial resources they do have are going to be invested in the classrooms where the teaching takes place and not wasted in non-learning areas such as the grounds, sports fields, offices and so on. In short, they don’t want their pupils disadvantaged just because of the accident of where they happened to be born. TT: Admirable. Do all schools think like that? COT: If only! In other regions it can be so frustrating where new schools are being built with beautifully landscaped grounds, reception areas that would put the most modern of office blocks to shame and Olympic-sized swimming pools but leaving nickels and dimes of a budget for fitting-out the classrooms where the actual daily teaching and learning takes place. Especially since it is now widely agreed that, after the teaching staff themselves, the teaching support technology is every school’s second most important asset. TT: Frustrating, as you say. COT: Very! We had a case just last week where the contracted builders of a new school are proposing to install display screens in the classrooms in place of IFPDs! These look like IFPDs and are cheaper because they are very simple technology being designed to be used in airports, rail stations, etc. They don’t, obviously, have any instructional software and they won’t be usable with the different types of interactive software resources that teachers will bring to the school. TT: What can you do? COT: We are trying to reach the new in-coming academics and the management board but that’s very difficult as they aren’t yet on the school site and most are still resident in their home countries. TT: Had you had previous contacts with this new school? COT: Actually, yes. The school’s owners commissioned an FF & E consultancy to recommend providers in, amongst other areas, classroom technology and we spent countless hours understanding their requirements, testing new software and pulling together a unique classroom technology solution for the new school. Then the procurement gets handed over to a sub-contractor with no experience in edutech and to maximise his profits he buys the cheapest and most unsuited screen he could find! Ever seen a grown man cry?!! TT: But won’t the new teachers be up in arms? COT: Yes but by then all budgets will be exhausted so they’ll probably rip out the useless screens and install ink marker boards. In 2015! TT: But that’s a one-off, right? COT: Unfortunately not. It happens all too often both with new build schools and schools who are replacing older classroom technology for new. We do try to appeal to the Principals but they tend to take the view that edutech is delegated out to the IT specialist and they won’t get involved. That’s a big mistake in my view because today’s professional edutech is centric to the whole school’s pedagogy philosophy and to the curriculum. 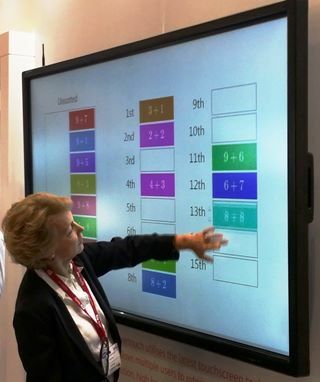 TT: So schools that are teaching with IWBs are now using old technology? COT: Yes but at least they are using digital resources rather than ink and chalk. But of course if they can budget to upgrade to IFPDs the whole teaching and learning experience ratchets up several notches and improves greatly. In fact, to encourage schools to trial the IFPD technology we run an offer of one CleverTouch per school at an ex-factory price which is considerably less than the standard retail price. TT: Sounds great. What’s next? COT: I’m having dinner tonight with the Principal of an international school based in Qatar who wants to adopt our technology. We’re going to chew the fat on his various options, you might say! TT: No, I meant in edutech. COT: Oh, sorry! Well at this moment all our investment is going into improving and extending our IFPD range (CleverTouch) but possibly in time we may add interactive 3D if the software progresses sufficiently in that direction. I don’t think interactive 3D will be used in every lesson but for Geography, Biology and the Sciences for example you can imagine the scope that interactive 3D would bring to lessons in those subjects. TT: Sounds fantastic. If only I could have had such stimulating experiences when I was at school. COT: Agreed. With CleverTouch, teachers can utilise three of the five senses of their pupils; that’s touch, sight and hearing. We’re bringing smell into play now and thinking about how taste could be incorporated. It’s really all about working outside the box every day we arrive at the office. How can we keep improving the teachers and the pupils pedagogical experience with our front-of-class presentation technology? That’s how schools who become a customer of ours continually benefit from these on-going developments. TT: Sounds like there’s so much to look forward to. Chris, thanks for your time and the insights into your world of edutech.